Truth is indeed stranger than fiction. Spike Lee's BlacKkKlansman addresses America's racial disparity from a truly novel perspective. A black detective ingeniously infiltrates the Ku Klux Klan in the early seventies. Along the way, he struggles to reconcile his duties as a police officer against the virulent racism subjugating his people. The story is so wild, it borders on the absurd. This is the reason why BlacKkKlansman is so incisive. It is both hilarious and terrifying. This Spike Lee film paints a raw and ugly picture of humanity's worst instincts. John David Washington stars as Ron Stallworth. In 1972, he was the first black police officer to join the Colorado Springs Police Department. Stallworth was well spoken, genteel. The rookie's bushy beard, afro, and black skin did not sit well with his racist colleagues. His first assignment was to infiltrate the local black student union for agitators. Stallworth listened to the powerful voices of black struggle, but was beholden to a law enforcement organization that viewed black power groups as a dire threat. Stallworth came across an ad for the Ku Klux Klan in the local paper. He simply called them up and reinforced their racist dogma. "Niggers", "fags", "Jews", and "spics" were destroying this sacred, white protestant country. The Colorado Springs KKK welcomed Stallworth's venomous tongue. They couldn't fathom they were speaking to a black policeman on the phone. But the game turns deadly real when the KKK decides to bring the newest recruit into the fold. Stallworth teams up with Flip Zimmerman (Adam Driver), a Jewish officer. Flip would portray the in-person Ron Stallworth to the KKK. As both men earn the trust of the Klan, Stallworth's stock rises to the attention of the Grand Wizard himself, David Duke (Topher Grace). BlacKkKlansman is a hard-hitting, unvarnished look at racism. It's also knockdown funny at the same time. It's a bizarre feeling to laugh so hard while witnessing such despicable behavior. Stallworth's conversations with the Klan, especially David Duke, are surreal. The blinding hatred and racist dogma is on display in visceral detail. Sunlight is the best disinfectant. Most of the Klan members went to great pains to hide their affiliation. But with the curtains closed, their sinister intentions were revealed. Stallworth and Zimmerman exposed them as murderous thugs in a war for racial dominance. The apple did not fall far from the tree and is not as green as expected. John David Washington, the son of Denzel Washington, is a revelation. Ron Stallworth was a tightrope walker. His lifelong dream was to be a policeman. When given his chance, he knew just how harshly the spotlight would shine on him. On one hand, he had the racist cops and the genuine fear of a black uprising working against him. Then he had to lie to the black students, including his love interest (Laura Harrier), about his true affiliation. The same dichotomy affected Flip Zimmerman. Adam Driver has a powerful monologue about never seeing himself as Jewish. That changed when he was forced to be an anti-Semite. Can you imagine hanging out with Nazi enthusiasts as they dispel the Holocaust as a Jewish scam? Washington and Driver do the real policemen they portrayed justice with their excellent performances. Spike Lee's script, co-written with Charlie Wachtel, David Rabinowitz, and Kevin Willmott; has a lot to say about the racial divide. Ron Stallworth's investigation is used as a canvas to illuminate hard truths. From the KKK's legacy of terror and lynching, to how black features are judged, issues a plenty are laid out in striking detail. Some may view Lee's approach as being too preachy. I have a feeling this will depend on your view of Spike Lee in general. I judge him here as a director, an artist. In this regard, his work is masterful. Jason Blum and Jordan Peele, the producers of Get Out, notch another amazing film. The pair co-produced BlacKkKlansman for Focus Features distribution. They've earned another Best Picture nomination. BlacKkKlansman is audacious and imaginative. 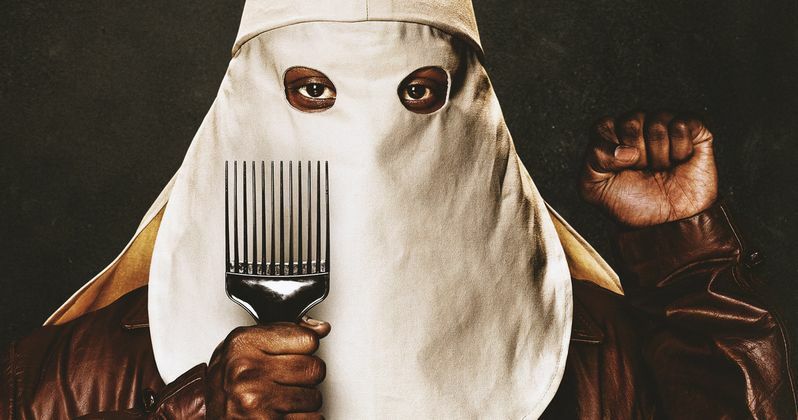 It is a distinct cinema experience, meant to be provocative and thoughtful; but above all else, BlacKkKlansman is damned entertaining. There isn't a second of boredom in this film.